Most homes need a little TLC before the temperature drops. 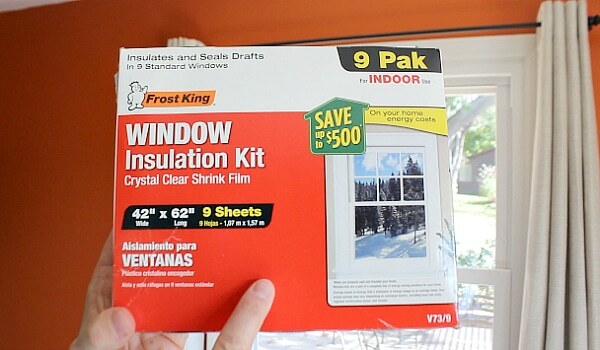 And this tutorial is going to help you keep heating bills low by adding window insulation. Plastic film insulation kits cost 10-$20 and you’ll be able to insulate multiple windows. One of our awesome community members also gave me a mind blowing tip that adds even more insulation value for only $5. Not all of us have brand spanking new windows. As such, we suffer from chilly drafts (and probably cold feet, haha). One way to stop the cold air flow is to use plastic film insulation on widows. If you’ve got old windows in the basement, the kind that are made from wood and swing open, then these tips will really come in handy. 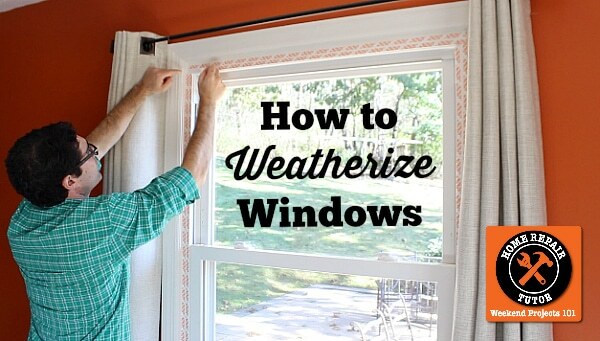 I’ll show you how easy this is to do and one extra step you can take if the windows are really in bad shape. As you can see this project isn’t going to break the bank. Although I haven’t done any official research studies I’m willing to bet you earn back the money spent in one winter season. Learning how to weatherize windows with plastic film insulation might just be your next weekend project. Let me show you a great tip on how to double up on window insulation. Debbie is one of our community members and she gave me a great window insulation tip. Bubble wrap is plastic film with air filled pockets. 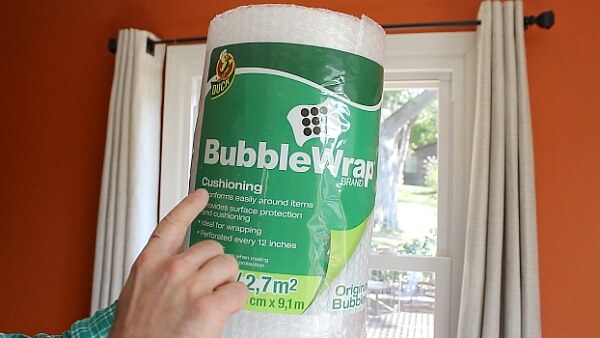 You’ll want to add the bubble wrap to your window before using the window insulation kit. 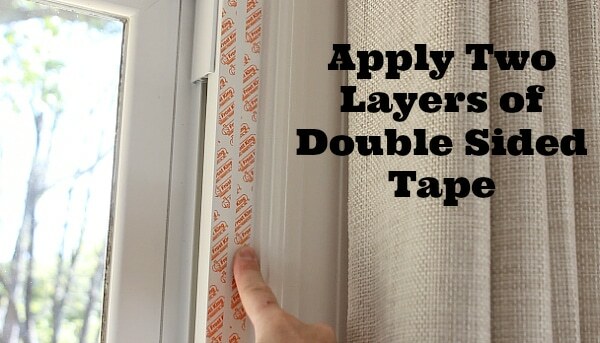 Open the window insulation kit and take out the double sided tape. Clean the framing of your window with a damp cloth or rubbing alcohol. 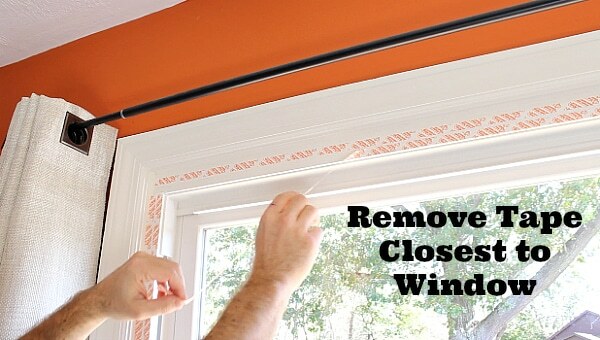 Apply one layer of double sided tape to the window frame. Then add a second layer of double sided tape next the first layer. Let the double sided tape sit for 10-15 minutes. This allows the tape to become tacky and setup properly. Peel off the backing on the first layer of tape and apply the bubble wrap. I show you exactly how to do this in my video. Add successive layers of bubble wrap and overlap each layer by about 2-3 inches. You can trim the bubble wrap with scissors. Use packing tape to seal the top of the bubble wrap if it starts to bend downward. I also sealed each vertical overlap with the packing tape to make it one cohesive unit. Using bubble wrap is such a fantastic idea by Debbie and I’m excited to use it on some of my rental homes that have older cellar windows. Now that the bubble tape is in place you can add the plastic film insulation. These two insulation techniques will seriously put a damper on old man winter’s party. Now that the bubble wrap is in place you can add the plastic film over it. Peel off the second layer of double sided tape and unfold the plastic film. Make sure there’s at least one inch of excess film on all sides of the tape. Adhere the plastic film to the tape starting at the top, then the bottom and finishing off with the left & right sides. Grab your hair dryer and work out any wrinkles in the film. Spray foam insulation can also be a great way to lower utility bills. Our detailed tutorial shows how to easily use spray foam around the house. Making a trip to the store this weekend and hope to tackle our bedroom windows first. Just wondering about removal of the double sided tape in the Spring……thanks for the tips! Glad you liked the tips Mary. I’d try using a hair dryer to loosen the tape. It might be the best option. Strippable Caulking works and doesn’t leave a residue. You can use painters tape and rolled plastic instead of the double sided tape. Third winter in my new home and it works great. Use a roll of 6mm or greater. I have window units in my home. Would it work over those as well? At the moment I have a trash bag over them then completely covered with ductape. It stops the draft, but still there is a cold chill coming from those windows. Oldie but goodie: hang plastic sheeting of some kind inside your curtains. Incredibly cheap, invisible and effective. Works in hot and cold weather. For drafty windows: caulk around tHe outside of the window, and on the window trim on the inside of the room. (That’s the boards around the window). To see where air is getting in, move a candle or an incense stick around the window and deal with the air leak accordingly. This is a great idea provided you don’t mind not being able to see out your window once you install the bubble wrap. Yah it’n not perfect Penelope. But for unused rooms or basements I think it’s a great option. Thanks for the great tip !! Although meant for cold winters, I bet it would work great for those weeks of 100 degree days here in San Antonio. I would love to win the window insulation kit to use in my 114 year old rental home! There is an old porch off the full bathroom upstairs that someone attempted to add windows to at some point. Needless to say they don’t seal and there is always a draft. This would definitely help the tenants and would also be able to stay up year round if necessary as most tenants use the porch for their plants. What an awesome idea for those drafty and cold emitting basement windows. That is where I am going to use this fantastic idea. I will be able to go downstairs and work and not feel that cold draft. Will try this. I have older single pane wood windows. Can’t wait! Love this bubble wrap idea. We live in an old, drafty farmhouse, and my sons have the upstairs. The windows are very old and drafty, and there is no heating duct up there! Last winter when it was 10 degrees for about a week, they had to sleep in the living room. I think this insulating idea will work wonders! I was waiting til the end of the tutorial…and there it was…I live in Florida, and my summer air conditioning bills are really high. So I’m going to look into the insulation, maybe they have some for glass doors, too. I sure would appreciate winning some window ones from you. I love your site. Keep those ideas coming, please. Great tip! We live in an old home with very drafty windows. I will use this in our walk in closet (converted sleeping loft), some windows on the main level. and our bedrooms. Thanks or the tip! The bubble wrap idea is great and I’m going to try it on one large window that we have in our basement. Keep me updated Ingrid, I’d be happy to answer any questions. i would use the kit in the kitchen, the room we spend the most time in! apparently the windows we put in 13 years ago are now dinosaurs and no longer energy efficient (as confirmed by our winter electric bills!). Those bills stink. Sorry to hear your house is holding the heat. Have you added extra insulation to the attic Fran? Hey Jeff – great tips … amazing that something so simple could be so helpful this time of year! The vid and post make it look super-easy. I have those basement windows that are exactly like you reference … large ones in our walk-out basement that swing open. I want to put a curb on the heat-loss there, especially since that cold air loves to settle down there! 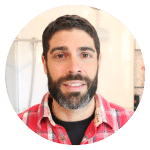 In terms of some other tips – I often use rolled-up towels along the floorboard by doors, even with a great weather-strip to add some extra insulation along those cooler spots in the winter! Thanks David for the towel tip. I actually saw that Frost King is selling those in Lowe’s or Home Depot. You’re right, the drafts seem to find their way in the house regardless of our best efforts. This is a terrific idea. I live in a small old apartment, the windows are very thin. I plan on covering my sliding glass doors and the rest of windows. Don’t forget new weather stripping. My wife and I just moved into an older townhouse in Maryland. The windows are old and don’t seal properly. So, we would likely use this tip on most of our windows in the house. This is our first home after apartment living for two years and would love to find a way to keep utilities down! We also have a large sliding glass door to the backyard, since we can’t cover this we will be getting thick drapes from Bed Bath & Beyond to help block the cold! Congrats Eric on your new home, that’s great news!!! I will definitely be trying out the bubble wrap inside the insulation film this winter on two of my basement windows. We found that the cost of heating that level of the home was so great that it was just better to weather-proof it as much as possible and then shut it off. With a walk-out patio door, we have also used clear shower curtains and plastic table cloths to cover this area larger than the winterizing film available in our area. Since the lower area of the home is actually a studio apartment that would help bring in income, it would be so nice to have a way of winterizing this without having to shut it down each winter. Replacing the door and two windows just isn’t possible on our income, so that is another reason why we look for great home ideas like this. I recently cleaned and painted my basement floors and walls in my 1930’s farmhouse. My daughter has now claimed it as her winter playground. We moved in her outside toys, slide, scooter and bicycle so she can still play throughout the winter. It’s pretty drafty down there, so I plan to use this bubble wrap and window insulation idea to cover the windows and maybe even the basement door. Wow Kristina, that’s some basement. Your daughter must be thrilled for winter to come!!! She could play outside in the snow then come inside and pretend like it’s a playground. That is so cool. I am restoring an 1880’s 3-story Victorian that has over 60 wooden windows and doors. (There are 25 on the first floor alone.) The house was neglected for many years before I purchased it. I live in the house and am slowing restoring it as funds and time become available. This has become more difficult in the last year since I am out of work. For several winters I have stapled thick drop cloth plastic purchased by the role on the outside of the first floor windows. The plastic is quite thick and semi-opaque so it holds up to the winter wind that whips up the street from the river. This was done very neatly so it didn’t look too bad and is quite inexpensive. You can also make a simple wooden frame and staple the plastic to the wood so that the “storm window” can be removed. We chose not to do this because of the variances in each window’s shape caused by 115 years of aging. So we simply staple the plastic to the outside rim of the window trim. There are two rooms we do heat though and I will try the bubble wrap solution on them this year. Thanks for the tip. I love this idea! We always put the window kits on but we have a very old victorian with very drafty windows. These PA winters are just awful for this old house. I will definitely be using the bubble wrap idea this winter. Especially on the attic and basement windows. Thanks so much for this tip. Last winter was brutal Patricia. Here in Pittsburgh is got to -10F. I like the winter but that’s way too cold. Makes me shiver right now!! We live on Mt. Hood and these save SO much heat IN the house. I use them on ALL the windows! I’m no expert, but I have some observations. My house was built in 1979 and I am the original owner. When I remodeled, we replaced a few windows and doors. It was then I noticed that the gap around the windows and doors under the trim was never stuffed with insulation. So at least part of the air leakage was coming from under the trim. I carefully pulled the trim from the windows that were not replaced and filled the gap with Great Stuff (foam insulation in a can). Or you can stuff in some fiber glass insulation. Then the trim was tacked back. I know thermal pane windows are R3 rated as compared to wall insulation for walls is R11. However, new windows now have a confusing E rating these days. I suspect retailers use it as a selling point as “double your window insulation by making it a triple pane” at considerable cost to really make them R4.. Unless glass is broken, how can glass be drafty other than the cold coming through. The bubble wrap looks like a fine idea, except I believe it would even be better if the tape was put on the wall so the bubble wrap goes beyond the trim. What do you think? To check, I think it is a good time to start smoking again for a few hours. On a windy day, place the cigarette near the windows and see if the smoke blows away. To change the subject, I’ll say a few words about fall leaf clean up. I find the paper bags a pain to fill. My town, and I assume many others, will allow you to stuff leaves in your standard trash can on leaf pick up day. Lawn waste day is Monday and trash is Tuesday. I plastic bag my regular trash and stack it in the garage to keep it away from critters. I stake or weigh down a blue plastic tarp on the lawn and rake the leaves onto the tarp. Roll up the tarp and the leaves slide into the trash can easily. When the can is full, I rake more leaves on several more plastic tarps and roll them up like a burrito, hold them down with a brick until the next lawn waste pick up day comes again. No more bags, no more 30 gallon plastic cans to store and less work. Why can I use my bigger trash can for leaves? Because it has a gripper and the truck can mechanically lift the load. The town wants smaller leaf cans because they must be dumped in the truck by hand and that can lead to injuries. The final pick up is done with a lawn mower. I know there are mulching lawn mower. But I believe that will lead to lawn thatch to build up even faster. Or you will have a lawn that grows up above the sidewalk. I don’t know for sure, but I do have some lawn edges around here that are like a curb as they are so high. Another subject is crawl space insulation. The new standard is 4 inches above he rafters. When the house was new with no attic insulation, I had Sear blow it in. 30 years later if found out the insulation was blown into the eaves so there was no good air flow. So we installed baffles for 75 cents each between each roof support (what do you call them?). I raked back the insulation from the eaves. The baffles (Styrofoam kind of things to channel air from my eave to the roof vent) go from the eave to the peak of the roof. Then laid batt insulation paper side to the heated area and threw the loose insulation on top. The baffles keep my eaves free for good air flow. It is very hard to calculate savings as there are different thermal days and the price of natural gas goes up all the time. But the house is more comfortable in winter and summer. Wow Joe, thanks for all the good tips. Although I’ll pass on the cigarette part, haha. I think you have a ton of great points. I did give some thought to adding the plastic to the wall and think that would be the way to go. Especially if the window is older and you can’t determine if it was instulated properly between the studs. Oh Boy! Do I ever need to do this. I have so many many very old windows, aluminum from the 50’s and cannot afford to replace them. Oil heat is costing such an incredible amount of money , I am forced to keep the temp at 55 degrees. I need all the help I can find. Plus this seems easy enough for me to do by myself, which is also a necessity. What a treat it would be to remove just one layer of clothing……[and then I bet I could even bend my arms! ]……even a few degrees would help considerably. Walk past my windows in winter and it is instant frostbite. Splendid idea! Thank you and Thank Debbie. Sounds like you’re already getting your oil this month Char. We can all relate to those high heating costs. Man it’s expensive these days. Thanks so much for your kind words. For some reason I have three windows from the house to my attached garage. Being original 1950s windows, leak. Since I never look out the window to see how the car is doing, I’m going to bubble wrap and shrink wrap those windows and just never take them down. Thanks for another great idea. I have radiant barrier in my bedroom windows then thermal drapes. It’s really nice and dark in there but I think it helps but looks really bad from outside. So thanks for the tip! Radiant barrier has been on my radar Terry. Do you have it any where else in your house? Another choice is to cut and force fit sheet Styrofoam insulation from the big box store. Or, it can be held in place with those rubber magnets with the sticky backs. It may then be removed on nice days for the view, heat gain from the sun and cheer up what has become a cave. Have the kids decorate it with their art work or use contact paper to match your decor. It seems to me that over the last 35 years, the weather has become very changeable over short periods of time. Therefore, it would be nice to have something that can be removed and replace easily. I have a couple of older wooden single pane windows that face the inside of my garage. I’m looking forward to trying the bubble wrap insulation. Thanks for all of the great ideas. Single pane windows certainly could use the film and bubble wrap Connie. Let me know if you have any questions. I live in a home built in the 1800s. I rent so cannot update windows, but they are very drafty (curtains blowing in the winter drafty)! This is a great option for renters Janet. You can re-heat the tape in the spring to help remove it from the window frame. Hope this helps you with your heating bills. I really like this idea. Living in Arizona, we have finally moved to the point where we can OPEN windows. I will definitely hold onto this idea for next summer. Though it is not “pretty,” it would still allow us to have some kind of insulating factor without living in a cave (i.e. the curtains drawn to keep out the radiant heat). This will be especially good on my western facing windows. You are the man Adam!! I’ve never heard of a Heater Box but that sounds like a fantastic idea for hot weather climates. Thanks buddy for your awesome suggestion. Make sure you tell me if you visit Pittsburgh over the holidays. I’ll take you out for a beer. We have used the window insulation on our windows and it really works great. We had it on our front picture window and you would not know that it was there. We have since replaced the windows, but just want you to know it works very well .My daughter lives in a very old house that is very drafty and she could really use the insulation on every one of her very old windows. We would like to help her in any way that we can. She is a special hard working Mom. I think this is a great idea! Our windows are fairly new but when we ordered them we totally forgot about the basement windows. So I will definitely be doing this on them for sure. I noticed last year when I was in the laundry room down there it was just a little drafty, but this definitely will take care of that problem. Thank you for the great tip! Yah Kathy, basement windows are superb place for this insulation. Hope your toes are a bit warmer this winter season. I had been thinking about insulation for our windows facing the north for winter. Great timing for me. Even in northern Alabama it can get cold. Especially that north wind that makes the entire side of the house colder than the rest. Thanks for the tutorial. I am going to use this on the window in my front entry door, it is the only window in my home that is not double paned. I wrap my screens in Saran Wrap and put them back into the windows. I like that idea, sweet. I’d take it a step further and use Pressn’ Seal. Love that stuff. Thanks for the tutorial about insulating windows. This looks doable and affordable and will be something I will work at doing before the cold weather sets in. I would definitely use the window film in the window that is in the finished room over the garage. That window seems to be the worst when it comes to the cold weather. Thanks again for an awesome tutorial! Good idea Marilyn with finished room over your garage. I’m sure it gets cold up there!! I live in an older mobile home in Wittmann AZ. Arizona is known for the 3 digit summers but l’m here to tell you the winters can be mighty cold! In preparation for the winter I caulked the windows inside and out. Adding the bubble wrap and plastic film will be my next project. Oh my gosh Celeste, I can only imagine how cold it gets. Great suggestion with the caulk. That reminds me, I bought removable caulk for this tutorial and forgot to show everyone my idea. I managed to remove moisture from a double glazed window by removing the double gazed unit from the window frame and drilling 3-4 small holes at the top of the unit and then by using an electric hair dryer warm the unit until the moisture is displaced from the pre-drilled holes, which are then re-sealed by using an appropriate sealer or glue. I carried out this repair several years back and it remains good. Whoa, that’s a great tip Robert. Thanks so much for sharing because a lot of members have had the same issue. I bet this will come in handy. thanks for the bubble wrap tip. My family room is the length of the house, all 5′ sliders my Mom had installed years ago. They’re double pane but doubt they are the best insulated. I’ll get my husband to try this on all the north windows. we never use those, they overlook the driveway and are always closed but drafty. I may use it on the other north windows, and definitely the basement windows too, just for the saving heat factor. We heat with pellet furnace but there are occasional times we need to use the oil furnace. I have single pane wooden windows that are very drafty. I bought a big roll of bubble wrap. On the back of the house I used double layers of clear bubble wrap. To apply I used a spray bottle with a little bit of dish soap. Just spray it on the window and then apply the bubble wrap. I also used some painters tape on the corners, just in case. On the front of the house I have a big picture window, I used the film on that. I have a sliding glass door that lets a lot of cold air in, but I haven’t found a solution for that yet because I have to let the pets out. Awesome tips Lilly. Again, it sounds like you’ve had good success with the bubble wrap like the other members. I’m so thrilled that this is a time tested method. I have happily used bubble wrap for several years, but have never used it with a window insulation kit . That’s a good idea. There is an easier way to put up bubble wrap: spray the glass with water, then while still wet, press the bubble wrap to it. This works great and the wrap has stayed up the entire season (Minnesota). My xl windows and the patio door have needed tape along with the water spray to stay in place. I suspect the window insulation kit would help that, too. I bought a huge roll of the bigger bubble wrap, the kind used for furniture. I cut pieces to size. I used a marker to label which window and have reused the wrap each year. Wow Hilary, thank you so much for the great tips. If this works in Minnesota then I’m sure the rest of us should be in good shape. Love you idea of labeling and reusing the wrap. Wow ! My house was built in 1901 . I have been able to install storm windows on most of the ones in the house . but there is very large sliding window that defies an inexpensive fix due to its odd shape . Older homes have some of the prettiest windows. But they come with a price of being super inefficient. I bet this would help you Tim. I would use the shrink wrap on a sliding door that is drafty and needs replaced. Good plan, those sliding glass doors are pretty but the huge pane of glass can let in a lot of coldness. I plan to use this on my glass porch…….the wind just blows between the panes…..thank you everyone ……..
Wow, this is like putting an overcoat on over a sweatshirt. I have a window with a cat door and I am doing this to that window. I plan to cut a slit for the cat door and then tape around the door. Any good tricks for the cat door it self? Do you already have the cat door Terry or are you looking to modify an existing setup? My craftroom is really drafty, and this is a perfect place to use this! Great idea. Hope to win! we live in an older mobile home and have been using bubble wrap and plastic for a few years now and swear by it. Just keep in mind you can not see out very well. We usually keep 2 windows free of bubble wrap just to see outside! Winter can get depressing if you let it! Thanks Lesa, sounds like you’ve had good success with this technique. I agree with winter depression. Gotta get some sunshine in the home for good mental health!! Love this idea. We just moved to a newer house, but the windows are metal (previously we had vinyl triple pane). We are noticing condensation on the windows (inside the house) and I have to wipe it up with a towel. Will this prevent that moisture or will I just be trapping it between the bubble wrap/insulating sheets and have a big mess come Spring? Living in FL, we never expected our windows to radiate so much COLD. Thought we had left that back in Michigan. If this works, it could save us thousands…from having to replace all the windows. Thanks for the great tip. PS-lots of bubble wrap left from our move…glad it won’t go to the landfill now. Congrats Heather on your move. Yep, that bubble wrap will totally come in handy. I’m not sure what will happen with the condensation but you could try this method on one window and see what will happen. It would be a good experiment. This idea would be great on all the basement windows. Last winter was so very cold and with the basement so cold I’m afraid of pipes freezing up. Thanks for the ideas. I agree Cali, these kits are great for those old basement windows. My daughter just moved into her first apartment with 3 other women. It’s a drafty multi unit in Portland Maine. They could really use some buttoning up this winter and I’m sure these 20 year olds aren’t budgeting to keep out the cold. If I win, it will give me an excuse to go visit her! Thanks for the tutorial, very timely! What a great idea!! I live in the basement of a double wide and it’s just so cold here in Michigan in the winter. I’m heading to the store later today!! Hi Jean, I don’t see why it wouldn’t work. You should give it a shot. Here in New Mexico we have companies that will set you up with solar for the price of your existing bills. Sounding better and better to me especially after reading, “This Changes Everything” by Naomi Klein. We have been attaching clear plastic sheeting over the outside of the windows on our north facing bedroom during the cold months. We do have radiant heat which is lovely (as long as the boiler holds out). Thanks Jeff for the interesting idea. Hey Lannie, hope your boiler holds up this winter. I know firsthand they’re expensive to replace. Keep me posted on the solar idea. I’d be interested in learning more. Fantastic Idea. Live in Pa as well and last winter was a nightmare. I’ve used the window insulation kit before but was never really satisfied with the results. The bubble wrap really makes sense. I plan on using this on the windows in the master bedroom and the spare back bedroom where we seem to get a lot of drafts. Hope we don’t get another frigid winter this year Jody. It was so darn cold. I bought removable caulk yesterday and this wonderful idea for my old loose window panes is just what I needed. Thank you for the tutorial. I have no ideas to add and think that my old “fixer-upper” is about to whip me. Let me know how you used the caulk Carol. I bet a few other members of our community would love to hear how you used it. The winter seems to bring our the fixer upper in all our houses, lol. This is a great tip Jeff! Thanks for sharing it. I’ve been using foam board, plastic and cardboard on some of my windows. We have two windows that are so bad, the wind will actually blow the plastic off if I shrink it. If we leave it un-shrunk it can be rather noisy. Any tips for these windows? Oh and will the large bubble wrap work as well? I bet the large bubble wrap will work Kari. You might want to use temporary caulk to seal the gaps around the windows and even between the two sashes. Then you can remove the temporary caulk when it warms up. My husband and I sold our big home in August after he had 3 heart attacks. It was just too much for us as far as upkeep. We have downsized and are temporarily living in our 5th wheel camper. We are searching out ways to insulate and get ready for winter. We live in the Blue Ridge Mountains and it can get pretty darn cold here. I love the idea of the insulation with the bubble wrap as well as the other wrap. It just might help us to stay warm this winter. Thankx for this tip!! Hey Pamela, first I’m glad to hear your husband is doing better. How scary is a heart attack, right!! Oh I’ve seen it Denise!! It’s pretty darn scary. I grew up during a time in life when my Dad would weatherize the windows every winter with some sort of strips and plastic sheeting. I can only imagine how much the bubble wrap idea could have helped out back then! Wish we had known. Great idea! So glad you shared it with us. Oh my goodness!! We literally just took all the curtain down and are doing fall cleaning. Perfect timing as it is just starting to get a bit chilly at night with the windows open. The sliding glass door in the kitchen needs this. It makes the whole house cold in the winter and it’s going to be pretty cold in FL this year. It’d be nice to come home from work to a house that isn’t a complete icebox. I love the window tips and all the tips in the comments. We have a house from the 60’s with large aluminum windows that go about a foot from the floor. In my son’s room we used heavy curtains but it did not keep the cold air from rolling down the window beneath the curtain and onto the floor. As a temporary measure, I tacked a folded king size white sheet around the frame of the window and it seemed to keep the room warmer. Funny story–my son had been complaining that it was much colder than before so I finally checked the window and it turned out that the lawnmower must have thrown something and busted out a fist size hole one of the upper window panes. Poor kid. I will definitely try your tips. Thanks. Thank you! This looks great. I have plenty of windows that could use this. Any ideas on how to stop losing heat through the floor? My home is built on a concrete slab, and my lower level has ceramic tile flooring. It’s cold! Boy Adina, I’m not sure what to do in that case. I’m assuming you’re referring to the tile being cold? My Aunt & Uncle have a wonderful home that is on the Arkansas Historic Registry. I will use it to help them winterize this beautiful (if somewhat leaky) craftsman located in Sulphur Springs AR. I love the additional bubble wrap layer as we just used the Insulation Pack last year and while it helps, it just wasn’t enough. We use it in our living room and dining room because they both have large windows that bring in a draft and the rooms just don’t seem insulated right. We wonder if it has to do with our unfinished basement underneath those rooms. I’m so glad I stumbled upon this site. The whole backside of my house is windows and they definitely need to be insulated. This information will give me the encouragement and help I need to do the job. May take a while but it will pay off in the months to come. Thank you so much for the help you provide and I plan on checking out your website. Feeling determined. I definitely will be using this on 7 of my windows. I am a stay at home mom and can’t afford high heating bills. I set the thermostat at 62 at night and when we are not at home and 65 when we are at home. Thank you for the great DIY information. What a great idea for those of us on low fixed incomes! Thank you so much! Hi Jeff! Thanks so much for the great idea – this will be our first winter in the Blue Ridge Mountains and the propane we have been heating with so far is really expensive. I haven’t found a job yet so every little bit of savings adds up, so I will definitely be starting this project as soon as I can get the materials together! Sorry to hear about your job situation Lissa, that’s a tough one. But I’m sure something good is right around the corner. I just moved into a 80+year old home and sounds like this might weatherproof the windows until I can replace them in a year of two. We have really bad drafty windows in our bedroom in this rental house. I used this plastic shrink with a hairdryer kit before. During the night the wind would blow in, the plastic would bow inward, and the popping off of the tape around the sides would keep me up. Theres just no tape strong enough that will keep the plastic anchored to the wall or trim. Oh boy, sorry to hear about your experience Dana. I wonder if the packing tape would help? Sounds great. Do you think this would work with windows in summer in Arizona? I am for sure going to try it. Thanks for the tip! I would use the kit in my basement windows. They are the old kind of windows that drop open with a latch. My house was built 58 years ago. My dogs, Teddy and Chico would like it warmer where they sleep. The floors are freezing so I know I have issues in these older windows. I am a single but I think I can do this all by myself. I appreciate learning how to do things around the house and feeling accomplished that I can do them. My utilities usually average 250. a month. My dog does not stay outside all of the time, but he does love to go out. He also loves his dog house. I didn’t have an insulated dog house so I turned my dog’s into one. I wrapped the entire thing in attic insulation somebody gave me (except for the door) & then wrapped a plastic tarp completely around that. I duct taped it where the tarp met the opening. I set it up on low concrete blocks (garage sale purchase) & put it under the overhang on the patio facing toward the house & away from the any incoming wind. Inside it, I put a double layer of plastic bubble wrap (saved from a package I got in the mail) on the floor & topped that with a waterproof pre-k naptime mat I got at a garage sale for $1.00. Finally, I put in a piece of carpet cut to size (scrap I had), some blankets, & covered the door with an extra thick flap. I thought about putting straw between the patio & the underneath of the house, but it really doesn’t even need it. Oh man!! I can’t even tell you how much Lucky looooooves his dog house now!!!! It amazes me how much warmer it is inside since I did this. He gets curled up inside sleeping & sometimes he doesn’t even hear me call him. I literally have to reach in it & touch him to wake him up to come back in the house. With winter approaching, I thought somebody might like to know a way to create an inexpensive insulated dog house. I’m positive I didn’t spend more than $10.00 to create this masterpiece, & Lucky is one HAPPY dog!! Thank you so much Val for sharing your dog house insulation tips. Lovin this idea! Saw the bubble wrap idea with a little different technique a couple days ago. They said to mist water on the window and then apply it directly to the window. I think I like your method better. This will work great on my north-facing windows that are at times, I think, windows in name only. Especially when it’s 30 below zero out and the wind is blowing gale force from the north! Several years ago, I learned a trick to stop drafts on windows. Make a curtain for the window, allowing some excess around the sides so it extends over the frame slightly. Make 2 pieces and sew them together on 3 sides. Insert foam trays like grocery stores put meat on into the curtain and stitch up or pin the last side closed. I liked to pin it so i could was my curtain “pocket”. I made the slot for the curtain rod on one end before inserting the meat trays. Hope this helps somebody! I love your idea Pam!!! As I live in a double wide mobile that was renovated by the previous owner. Your bubble wrap technique is wonderful that I had not thought about. The inserts of glass cube windows in one bathroom and laundry room is where I will start. By the time I’m finished this mobile home it may look like an UFU!! And it just may float! I would love to win a window insulation kit- it would really help heat up the bedroom and kitchen! I love the bubble wrap idea-though not on main windows, as it will definitely hamper the view. This kit will be used in my basement apartment. I leave my plastic up all year…it even helps to keep the house cooler in the summer, saving on air conditioning bills! I replace it in the fall when the plastic goes on sale! Have saved hundreds through the years! Oh by word, I can only imagine how cold it’s getting over your way Christina!!! Do you have any special tips for insulation that you’d like to share? I’m in an older townhouse with single paned windows. Since its a rental unit I can’t make any permanent alterations so this will come in very handy. Hopefully it will ward off the high temps as well. It’ll work both ways Sandra, i.e. for holding in heat and holding in cold. Let me know how it works out. I’m actually going to do this for some of my older rentals that don’t have the best windows in the basement. Living in a Fema trailer is cold and drafty. I atleast want to do the 3 Windows on the N side. I like the way the light still comes through. I was afraid I was going to live in a dark dungeon this winter. I would use the kit in my son’s room, his room is north facing and the coldest in the house. I put a piece of weather stripping where the window meets the sill and seem to cut a draft. I recaulked the outside of the window and also installed thermal curtains to hold back the cold, recommended by my electric company after an energy audit. My double-paned windows were where the energy loss was greatest 🙁 in my house! I would love to do this! My hubby doesn’t think this works to save heat. Every time I suggest it he shoots it down. Maybe if I won free kits he wouldn’t be so reluctant to try it. Another way to cut back on ammount of tape used spray Windex on your window, stick the bubble wrap to the glass (it’ll cling to it) then add your window kit. 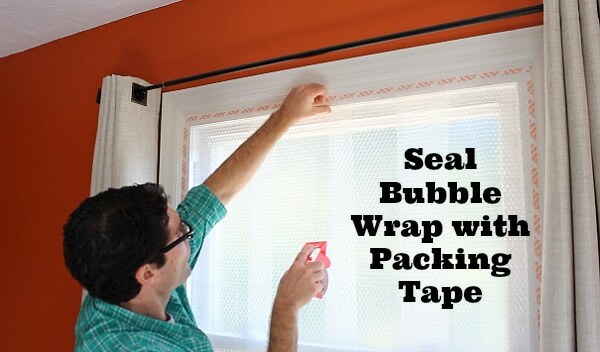 You will be able to stretch that extra double sided tape to more Windows or even different projects. I have used film fpr years. But haven’t tried bubble wrap yet. I would use it on my large picture window on my 50s house. I will use this in my bedroom as I lay there sleeping I can really feel the cold, so I am hoping this will make a difference… Thank you so much.. Wish I would have seen this earlier! I live in northern WI already in single digits and over 2′ of snow on the ground. My daughter’s bedroom has a patio door in it. I put plastic on the window but it collects so much condensation, her carpet gets wet. Her room is still very cold! Will have to take off plastic & try the bubble wrap 1st then the plastic to see if it helps keep her room warmer. Any other suggestions? I have used these kits for years!! I put one on the inside and one one the outside!! I love that I can still see out the windows unlike regular plastic!!! MY HOUSE WAS BUILT IN 1830 THIS TIP IS GREAT I AM DOING IT!!!!!!!!!!!!!!!!!! We need to do this with our enormous picture window in the living room. It is a single pane window, and is larger than three regular sized windows side by side. Plus there are double paned windows on either side of it. All in all, the entire expanse is about eight foot wide by about five foot tall. Try finding a window kit to fit that! I’m in Alberta Canada and our winters are often around minus 30 or more with wind chill. I always try and cover my windows to help keep heat costs down. Never thought about bubble wrap before… Will try very soon. Window insulation kits cost are overpriced. I refuse to pay that much for plastic and tape. Now I go to Dollar General Store and buy packages of 9′ x12′ plastic drop cloth ($1.25 each) and purchase double-sided tape at Office Depot (500 yards for $20). I can cover MANY windows for a fraction of the cost. It adds a bit of privacy with the “frosted” effect of the plastic. And don’t heat it with a blow dryer, it probably wouldn’t work on this type of plastic. Also, don’t put the tape on the face of the window trim, put it on the outer side edge so if there is damage, it isn’t as obvious. I need this for my son. They just had a preemie baby who is now home from the hospital, but their bedroom, where the baby also sleeps, is in the cold basement with leaky, cold windows. This would make the basement so much warmer for that sweet baby. I live in a van full time and will use the reflectex next to the windows then the plastic film over the interior side of doors/windows. This also gives a little privacy plus allows some light to creep into the interior of the van. I would love to be one of the winners of the Window insulation kits. I have used a roll of plastic table covering I had left over from my kids parties. It’s the runner kind you put on 6ft and 8ft tables. Plus side is you have different colors of window covering one was blue and the other yellow perfect to match any decor/kids room. Down side was the inability to see outside. We have rental property and what a mess the tape has left on the vinyl window frames. Thanks! My bedroom is always at least 20 degrees colder than the rest of the house. Half of one wall is a huge sliding glass door that’s so hard to cover. For curtains, I use 2 denim shower curtains that I sewed valances to the tops. Still cold. I heard about the bubble wrap, but I have heard 2 different ways to affix it… Bubble side down and bubble side up. There’s already so much moisture and mold that I’m hesitant to spray water! I was thinking of using push pins and would love advice on how to keep a peephole so I can look at the full moon without going outside as I walk by in the middle of the night? Thanks, again! How would you go about getting the tape to properly adhere to the old steel framing on basement windows, or maybe the concrete surrounding? I use bubble wrap on non insulated windows. All I do is cut it to size and wipe the windows with a wet cloth and then place the wrap on the window. If it starts to loosen after a few weeks I just re-wipe and re-stick. I use bubble wrap that I receive in packages so the whole process is free and it works great. Thanks Chris for your great tip and for recycling bubble wrap. My house can do with new windows that are better insulated this winter. I can’t really afford new windows right now though, but it seems like applying a window film to insulate them would work. So, you’re telling me that a plastic film insulation kit only costs between $10-$20? That’s a lot cheaper than installing a brand new window. I should get one of these insulation kits now that I know that I can afford to buy one. I want to try this on the shop windows. My husband and I spend a lot of time with projects out there. We have a wood stove for the winter and here in NC it gets really cold. The windows out there are older and the insulation would help keep it toast. We love DIY and enjoy your great tips. Thanks. I had never heard of the bubble wrap but sounds just like that’s what I need to do. The window’s in my living room ,there are two together that are suppose to be double paned but are not. I have a neighbor that burns wood all winter and since my windows are so , so crummy that is a great solution for me. The soot and black smoke just pours into my house and it’s such a mess trying to keep clean plus it’s very cold in the room. I have to buy a new furnace this year but maybe next year I can do something about the windows. Thanks for the great tips, Love your site. I am so excited I found this. We are retired and are renting a home that is about 35 years old and the windows are old and leak badly. Last year we had a power bill in excess of 350.00 for this 1100 sq. ft. house. If we want the downstairs warm, we bake upstairs in the bedrooms. Such a difficult time of year for us. Please help us. I’m renting a house with lots of windows in Portland, OR. I’m on a very tight budget, so any way to save that I can accomplish on my own, I will try. Keeping it warm will also help me medically. We don’t have a heater. We have a wood burning stove so keeping cold drafts out of the whole house wound be great! Gotta keep the kiddos warm!!! Our bedroom windows are badly in need of winterizing. Jeff, the bubble wrap is genius. As is doing the basement windows. I never thought of going that low! Mostly because basements in PA are creepy dungeon type places…would the double sticky tape even attach to cement? Also, while not a weatherization tip, its a pet tip that helps with weatherization…if you have cats that love being all over your windows no matter the temperature and they find the plastic a direct insult and proceed to shred a window or two every winter, get cheap car floor mats with spikeys on the bottom. Cut them to fit on your windowsill/ledges. Tack down if necessary. Cats and dogs too hate the feel of the gripper spikeys and will leave the window alone saving your hard work. In this article, they specify to put the bubble side against the window, without the airspace. This doubles the R vue of your window. And if you add the film it’s even better. My house has old roll out windows that do not seal very well at all. I would love to use the window film for both winter and summer. Keep the drapes closed helps a little, but not enough. I have 4 very old (orihinal) basement windows that need to be done. Tip insulate between the joists and foundation of the basement. I live in a drafty apartment(duplex) and we have to plastic every year.I love the idea of adding the bubble wrap. A few extra insulation kits would cut down our costs for sure. We do every window in the apartment so it gets costly! Thanks for the great tips. We have an almost 100 year old house in Rochester, Ny and the cold is coming. We have some new window but mostly old one and I look forward to trying this on a bunch of the windows thanks for the great idea. Thank you for the help. Last year I used just bubble wrap, and it blocked most of the chill. Hopefully adding your second step will stop it all together. We were finally able to replace a few old windows. Our friend, a contractor, installed them. They all leak, lesson learned. Lots of drafts in a 50+ year old house. Your ideas are so sensible and affordable. Thanks for all the tips and instructions. Surely I can do this. We moved to Colorado this summer and have yet to go through winter. I am going to tackle the basement windows first. A tip I’ve always used was making sure our ceiling fan rotates counterclockwise. For the older windows especially that have a gap where they meet in the middle or at the bottom sometimes locking doesn’t quite stop draft. I have taken plastic trash bags or smaller ones from grocery store and roll length or width wise, depending in the size of the space you need to close up. It even works great for the molding/frame above or below the window or door leading outside and you can stuff as many in there as it takes to close it up. Even seal the bags in the gaps with packing or masking tape. Then the bubble wrap and/or window kits for even more draft protection. Sounds like an amazing quick fix for both Winter and Summer!! I live in Green Bay WI and This is an absolute necessity if you want to survive our frozen tundra. We live in a 40 year old house with original windows so to stop the wind and snow from coming in this is what we always do. Also the electrical outlets on the out side walls need insulating. Here in Wisconsin we can purchase foam outlet pieces to put behind the outlet and switch covers on the outside walls. I recycle foam plates under the meat I’ve purchased in stores. I wash it well and soak it in bleach. Then I trace the plate/switch cover needed to be insulted, cut it out and Wa-La no cold drafts. We bought a home and it has newer replacement windows in the family room. The windows face the west. And let me tell you the air that leaks in around these windows in the winter is brutal! Our heating bills are outrageous. If you sit on the couch next to the window, you actually feel a breeze coming in. Brrrr!!! This kit sure would help us trim our bills down and make this room cozier! Thank you for the info! Looking forward to those colder temps…a little bit more. Need to do this for my daughter’s college rental house. Windows are old and in bad shape. It’s already cold and we haven’t hit our Michigan winter yet! I simply spray water on the window and the bubble wrap sticks. Bubble wrap is cut to fit and stays all winter. Then I remove and roll it up and store it. I have 25 yr old dual pane aluminium windows. Cold air doesn’t leak in around the edges it seems to cool the air through the windows. Now if I could figure out how to keep my floors warm. Need to insulate under the floor I guess. Crawl spaces are not my thing. i will be covering every window in my house.there are 10 windows to do. If you have a two car garage and only use one side, use the bubble wrap layers and then the final plastic film over the complete door to keep the draft and cold out. Pick the one with the most draft. I would use them on all of my windows if there was enough. My biggest problem window is my front window. It leaks so much I can see my curtains moving when it is windy out. To save money I check what the weather is going to be like daily. In the summer if it is cool at night I turn off the air, open all the windows and put fans in three of them throughout the house to rotate the cool air. I make sure to set my alarm for when the air is going to start warming up so I can close all of the windows and curtains. This really helps to cool the house down and keep it cooler throughout the day. It really cuts down on how much the central air runs. In the winter If it is going to be sunny out I open all of the curtains and let mother natural heat the house for me. If it is cloudy and windy I close all of the curtains. It takes a little planning and a little work but I believe it pays off each month. My girlfriends house has very old windows and very bad insulation. I’d love to help her do this and save some badly needed money! She has 3 levels and lots of windows so cost will add up but I have to believe the savings in heat escaping will offset it quite a bit! Im doing all our spareroom windows this winter and also making draft busters for door bottoms. Also doing my bedroom windows just to add that extra help. I am starting chemotherapy and am not messing around and trying to be as warm as possible over our long Michigan winter. We heat 100% with a wood pellet stove. Donors important to do all this to keep that heat in 🙂 Right down to hanging a heavy curtain over our unused front door. It has a window as well as its insulated steel. It’s a great door but it does radiate cold. I would like to use the kits to help out a friend on a VERY fixed income who just moved into an older trailer house in north central Texas. So that it will help keep her heating costs down this winter. wondering if taking the double sided tape will rip off paint on walls and window sills once warm weather hits again. We have long winters in alaska sometimes so the tape is on a long time. I would first use this in our upstairs bedrooms, sunporch, garage and basement. These areas allow a lot of cold air into the main areas of our 106 year old rental. Last year we have $300 monthly heat bill and I hope to keep that down this year. Never winterized my windows before but think I will this winter. Thanks for the diy. I live on a fixed income (Social Security) and moved into an apartment that has metal-framed windows. All of the windows will benefit from insulation, but previously broken windows have had Plexiglas stuck into them. It has not even been caulked, and when the wind blows, they bow inward. Although I plan to tape or caulk it myself, I am not impressed with its insulating value…especially since we are predicted to have an extra cold and snowy winter. Thank you for the information. It will help tremendously! I would use it on a large picture window in living room. When the wind blows hard you can actually see the curtains move. It’s crazy!! I would use this on my single payer front window! We own an older mobile home in mesa az. And they were NOT built for the weather here. No insulation and the windows are worthless. I try to say money on heating bill in winter, because summer bill is a killer. I want to do all my windows so I won’t have to use the heat in the winter… I will try anything to lower costs, being on social security makes pinching pennies a must. I’m hoping you show how to attach at the bottom of the window at the sill the correct way. This always causes me trouble. Can’t wait to use bubble wrap. I’d just tape off the plastic on the sill itself Belinda. If you are not sure if the tape will take the paint off with it, you can put the tape on the outer edge of the windows, next to the wall. It may still take the paint off, but at least you only have to repaint the very edge of the window, not the whole frame. Thanks for a great giveaway! We have an older mobile home. I would do my bedroom windows and maybe the living room too. I hate drafts and can always feel them. We have a house that is 200 years old!!! Single pane and wavy glass everywhere! ! I would love to try the bubblewrap…we live in pennsylvania and heat with coal….great tip! I think that your explanation above and through the video is one of the best. You did not tell us the thickness of the bubble wrap that you chose and you did not tell us if you put the bubble side to the outside or inside to the room. I saw that you chose 12″ x 30sq ft, but again, not the thickness. Also you said that you taped the overlap of the 12″ strips. Did you have to put another section of double tape on the top and bottom ledge to make the overlap of the previous section? I am thinking that the previous piece would have hogged up the double tape and when you went to overlap it would have no place to stick, unless you put a new segment above and below. On other sites, they have said to use 1/2″ bubble wrap, and some have used the bubble side out and others have used the bubble side in. You are the first to not put the bubble wrap directly on the window. (using a squirt of water to hold the bubble wrap in place.) Which when cutting to the size of each pane, adds a whole volume of possible extra useless effort. Others have also recommended that we search furniture and similar stores for the bubble wrap they get in on their items and before they chuck them. I look forward to seeing more of your videos and reading your articles. I will look back here to see if you have answered my questions above. Thank-you very much for your help. Just bought a Civil War home! Huge windows and lots of them, Drafty of course. Built in 1860. So yes need to do this at once!! Thanks for the advice and tips, didn’t know how to get started. I’m on my way now!! 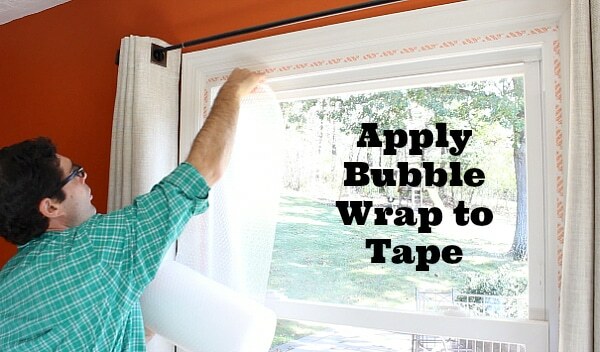 You can do the bubble wrap and the plastic like Jeff showed in the video, you can also buy window plastic with the double sided tape for the outside of the Windows and pattio doors. Works great. You put it on just like you do the inside Windows. Hi Jeff: We have never used this stuff on our windows, but we’re going to this year. Every little bit helps when trying to keep costs down. The bubble wrap tip is ingenious! I will definitely be picking some of this up at Walmart or Loew’s. Thanks for all your “How To” videos…they are extremely helpful to someone like me who’s husband is NOT HANDY at all and has no interest in learning, so I do it myself. He’s funny, he always says when I ask him to do something “handy”…”that’s why they have tradepeople honey, duh”. You’ve gotta love him, lol. I don’t have woodwork around my windows and am worried about the tape pulling the paint or Sheetrock off the walls. Will a hair dryer take it off of the wall as well. I made a blackout panel for the bedroom window and used it this summer between the shade and the drape to keep the heat out. Worked very well but want to make extra sure cold doesn’t get in this winter. I’ll use the films in my basement windows. In cold Quebec, Canada winters are fierce! We moved into a very old duplex a few months ago. There is already air coming in around the windows and winter hasn’t started yet!! I’m looking for all kinds of ways to keep the cold out, so can’t wait to try this. How much is the window cover cost. I’m a little old do u think I can do this. Do I have to wash the widows first. The woodwork to. I guess I should. I can’t go on a ladder I’m only 5″ and weigh 456lb. Well OK 463 lb give or take a few lb’s Well THANK YOU SO MUCH off to do my widow GREAT IDEAL. Great tips here. Definitely going to use the bubble wrap idea! One thing to note, i believe the Frost King kits are a one time use only. Wasteful and not cost effective. I went and bought a roll of very heavy clear plastic. 1 mil thickness I believe. It can be used season after season. Is there something to use under the tape that will make it easy to take off without messing up the window frame? Would glue work and would it stay invisible or would it turn yellow after awhile? I was thinking of combining the aluminum screen frame kit with a plastic/vinyl sheet, with a foam weatherstrip around the edges for a semi-permanent insulation. What do you think? Jeff… Is there such a thing as putting plastic on the outside of windows? Our living room window has blinds, and I’m not sure there is room to put plastic between the window and blinds… and I still want to have access to the blinds. I’m not sure about that Liz, wish I knew. It’s so windy here in Pittsburgh that the plastic would be torn off in minutes. Hi, I’m not sure if you answered this above but how can I avoid removing the paint on the trim when I remove the plastic and double sided tape in the spring? Or can you apply the tape somewhere inside the trim on the actual aluminum windows? Here’s a tip you don’t want to use the double sided tape in a rental unit. Mist the window with water, and stick the flat surface of the bumble wrap directly to the window. It will stick all winter with no issues and all you have to do to remove is pull bubble wrap away and dry window. I wonder if this idea would keep some of the heat out of the house during Florida summers? Pingback: Mobile Home Winterization Checklist: Let It Snow! Let It Snow! Let It Snow! Does this window insulation work for a shower window? This worked great, but… how do I REMOVE this once the winter is over? Try using a hair dryer to heat up the tape that the plastic film is attached to. That will help, and a if there’s residue on the window some warm soapy water is a good solution. This looks great. In a fit of emotions earlier this week after opening the heating bill (we live in Northern Minnesota) my fiancé and I literally put press’n seal over all the windows in the house and used a hair dryer to suction it. It’s working, but this seems a little less “ghetto” than our solution. Will give it a try. Lol, whatever works Meg. If your utility bill goes down then the Press’N Seal could be a better option. Thanks for sharing. hi, this may be silly but wouldn’t putting any kind of plastic up like this cause condensation and mould ? Could you use 2 layers of shrink plastic instead of the bubble wrap? Do I use the plastic wrap for both the inside and out or just one? If just one, which side would be better? depot right now. Wish me luck! A better and cheaper alternative is to use 2 x 30mm Bubble wrap, just as effective if not more. Fit the same way as you would the first layer, just spray some water that’s had a bit of dishwashing/fairy liquid.